Snowshoes enable you to explore the winter landscape more easily. 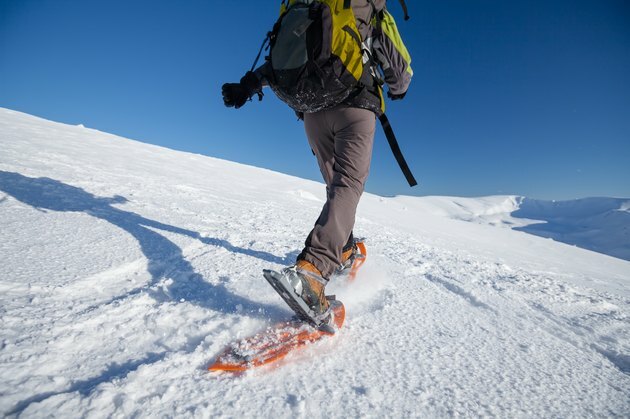 Whether you want to buy recreational, adventure, backcountry or fitness snowshoes, you'll need to choose snowshoes in the right size that will support your weight. The size of snowshoes you need will depend on the conditions in which you will snowshoe, as well as your weight and the weight of any gear that you will be carrying. Weigh any backpacks or gear bags that you carry with you when you snowshoe. Weigh yourself in your winter snowshoeing clothes and boots. Add your weight when wearing your winter clothes to the weight of any gear. Use this weight to determine what size snowshoe you need. Snowshoe sizes indicate the width and length of the entire shoe in inches. Fogdog Sports recommends that you get 8-by-21-inch snowshoes to support 75 lbs. to 140 lbs., 8-by-25-inch snowshoes to support 120 lbs. to 180 lbs., 9-by-30-inch snowshoes to support 160 lbs. to 220 lbs. and 10-by-36-inch snowshoes to support more than 220 lbs. Consult the manufacturer's size chart for precise size recommendations. Consider the terrain you in which you will be snowshoeing when selecting a snowshoe size. For example, if your weight puts you between two possible sizes, select the smaller, more compact size if you will be snowshoeing on packed snow or groomed trails. If you will be snowshoeing in fluffy, powdery snow, select the larger snowshoe. Try on the snowshoes that you are considering buying. Wear your boots to try on the shoes. Adjust and tighten the bindings. Your feet should remain fixed in place on the snowshoes. When you try on snowshoes, adjust the bindings while wearing your gloves or mittens. This allows you to test the comfort and ease of use of the bindings. Snowshoeing can be dangerous. Wear appropriate winter clothes and cover as much exposed skin as you can when snowshoeing. Always check the weather forecast before setting out.